Readers Respond on the "Origin of Computing"
In “Origin of Computing,” Martin Campbell-Kelly writes that the first digital computer was J. Presper Eckert and John W. Mauchly’s ENIAC, finished in 1945 as part of the war effort. But the first person to build and operate an electronic digital computer was a physics professor, as noted in “Dr. Atanasoff’s Computer,” published in the August 1988 Scientific American. John Vincent Atanasoff’s first computer was a 12-bit, two-word machine running at 60-hertz wall-plug frequency and could add and subtract binary numbers stored in a logic unit built with seven triode tubes. This was 1937. There was no war, no Pearl Harbor, just a theoretical physicist trying to solve problems in quantum mechanics with his students at Iowa State College in Ames, Iowa. CAMPBELL-KELLY REPLIES: Computer historians are cautious about assigning priorities to inventors. I did not state that Eckert and Mauchly invented the electronic computer but rather that they invented a particular computer, the ENIAC. I also said that “computing entered the electronic age with the ENIAC,” which is true in the sense of a practical computing instrument of fairly broad application. There were several electronic computing developments during World War II, both preceding and contemporaneous with the ENIAC, of which the Atanasoff machine was one—others included the NCR code-breaking machines, the Zuse Z4 computer in Germany, and the Colossus code-breaking computer in the U.K. In a short article I could not acknowledge them all. Atanasoff’s machine was a little-known computer that was restricted to a narrow class of problems, was not programmable and was never fully functional. Atanasoff discontinued development in 1942, and his work was virtually unknown until 1971, when Honeywell brought the suit against Sperry Rand to invalidate the ENIAC patent. During the trial it was revealed that Mauchly had visited Atanasoff and had seen his computer in June 1941. What he learned from this visit cannot be known, but the design of the ENIAC bore no resemblance to the Atanasoff computer. Mauchly himself claimed that he took away “no ideas whatsoever.” Although the judge gave priority of invention to Atanasoff, this was a legal judgment that surprised many historians. Your editorial “Fossils for All” [Perspectives] singled me out as the example of “how science suffers by hoarding.” This disrespects dozens of Middle Awash project scientists from 19 different countries who have worked on these fossils for years. We have shared our results by publishing 6,400 journal, book and monograph pages. Most recently, we have communicated project discoveries to the scientific community via the most extensive special issue of Science since Apollo 11 (www.sciencemag.org/ardipithecus). We reached the public with a two-hour television documentary (dsc.discovery.com/tv/ardipithecus/ardipithecus.html). 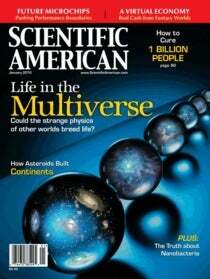 How and why did the Scientific American editorial miss that story? It closely repeats allegations made in the 2009 trade book Lucy’s Legacy, co-authored by Donald C. Johanson and Kate Wong (the latter is a member of Scientific American’s board of editors). It is of particular concern that Wong—who covers paleoanthropology for Scientific American—now claims to have done “most of the legwork on this particular editorial.” Journalistic standards were abandoned, as I was never consulted during Wong’s “legwork” or even afforded an opportunity to rebut the allegations. Nor does the editorial mention that these allegations were long ago shown to be baseless by multiple investigations (even though the complainants succeeded in persuading the National Science Foundation to impose a burdensome and inappropriate “data-sharing” requirement now detrimental to sustained paleoanthropological field­work). The second focus of the editorial was the marketing of the original Lucy fossil for an American audience. It left unmentioned the fact that Ethiopian paleoanthropologists were uniformly opposed to the export and display of this original fossil. The Middle Awash project operates in full compliance with Ethiopian antiquities laws and regulations—policies of a sovereign nation that does not need to be lectured about “open-access practices” or “doing the right thing,” particularly when these are so often designed to benefit non-Ethiopian institutions and their inhabitants. MARIETTE DICHRISTINA, ACTING EDITOR IN CHIEF, REPLIES: We hold White’s work in high regard, but the editorial was published more than a month before the Science special issue. It mentioned that critics of limited access to specimens commonly point to the length of time it has taken for the complete evaluation of Ardipithecus ramidus; in including that information, the board simply cited the most frequently given example for this issue. Further, the editorial immediately acknowledged counterarguments—noting the reasons for limiting access. And although the essay called for limits in exclusivity for such access, it did not make any pronouncements on what is appropriate nor make any judgment about White’s work in particular. The editorial board collaborates as a group on selecting the topic, reporting it and creating drafts of the text. Kate Wong’s having done “most of the legwork” is journalist’s lingo for “most of the reporting.” In other words, the editor who covers anthropology was primarily responsible for the fact-gather­ing for this essay, just as the editor who covers the energy beat would be responsible for information-gathering for an essay on related policies. But the essay as a whole is a group effort.